Abu hurayra Al-Hindi, Twitter post, November 19, 2015, 1:48 p.m., https://twitter.com/alhindi_hhh/status/667414056010162177. Al-Hindi claims to live in ISIS-controlled territory and uses Twitter to advertise an idealized portrait of life under ISIS rule. He advocates for hijrah (migration) to ISIS-held territory, and is a self-proclaimed terrorist who aims to kill infidels.Abu Hurayra Al-Hindi, Twitter post, September 15, 2015, 5:39 p.m., https://twitter.com/TruthFulFamily3/status/643902026842304512. Al-Hindi’s profile description, in which he claims to live in ISIS-held territory, advocates for hijrah (migration) to ISIS-held territory, and advertises his private messaging account on Chatsecure. Al-Hindi also urges viewers to kill kuffar (pejorative for non-believers). 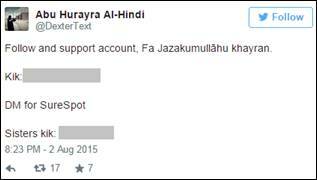 Al-Hindi uses Twitter to incite violence against infidels (pejorative for non-believers). Al-Hindi’s Twitter account advertises accounts on encrypted messaging services Kik and Surespot. 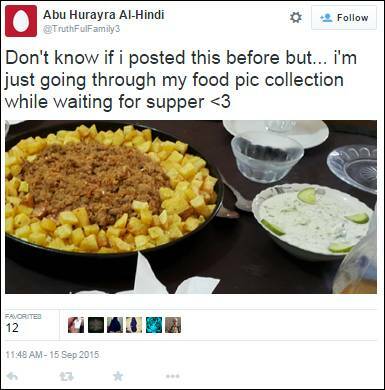 Amidst advocating for migration to ISIS-held territory and mass murder against non-believers, Al-Hindi posts seemingly banal pictures of food, allegedly from his home in ISIS-held territory.Abu Hurayra Al-Hindi, Twitter post, September 15, 2015, 11:48 a.m., https://twitter.com/TruthFulFamily3/status/643813644757811200. Al-Hindi posts banal image of food in an apparent effort to appeal to average Twitter users. In September 2015, al-Hindi created an Instagram account, although the account remains inactive as of October 2015. Abu Hurayra Al-Hindi, Twitter post, September 11, 2015, 8:37 p.m., https://twitter.com/TruthFulFamily3/status/642497186526269440; truthfulfamily, Instagram, accessed October 4, 2015, https://instagram.com/truthfulfamily. 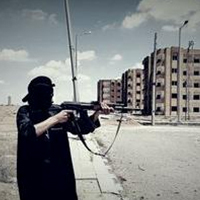 Abu Hurayra Al-Hindi’s Instagram account, created in September 2015 and inactive as of October 2015. @alhindi_hhhAbu hurayra Al-hindi, Twitter, accessed November 19, 2015, https://twitter.com/alhindi_hhh. @DexterTextAbu Hurayra Al-Hindi, Twitter, accessed August 3, 2015, https://twitter.com/DexterText. @TruthFulFamily3Abu Hurayra Al-Hindi, Twitter, accessed October 4, 2015, https://twitter.com/TruthFulFamily3. Al-Hindi al-afrikiAbu hurayra Al-hindi, Twitter, accessed November 19, 2015, https://twitter.com/alhindi_hhh. Abu hurayra Al-hindiAbu hurayra Al-hindi, Twitter, accessed November 19, 2015, https://twitter.com/alhindi_hhh. AbuHurayraZAAbu Hurayra Al-Hindi, Twitter, accessed August 3, 2015, https://twitter.com/DexterText. 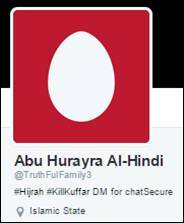 Twitter personality “Abu Hurayra al-Hindi” is a suspected recruiter for ISIS.